The legendary comedian Robin Williams was found dead Monday august 11/2014 noon at his residence in California, police suspects the death to be a suicide due to “asphyxia” a lack of oxygen or excess of carbon dioxide in the body that results in unconsciousness and often death and is usually caused by interruption of breathing or inadequate oxygen supply. Born in Chicago Illinois 1951, he went to Juilliard academy of arts where he studied comedy, and became a comic genius and a movie/TV star; he reached fame with his role as the alien Mork in the TV series “Mork and Mindy”1978-1982. “Good morning Vietnam”,”Awakenings”, Good will hunting”, Mrs. Doubtfire”,”Night at the museum”, are among the numerous film roles played by Williams. He entered rehab more than once due to an addiction to cocaine and battled alcoholism and depression before his death. His wife Susan Schneider a graphic designer said:”I lost my husband and my best friend, while the world lost one of its most beloved artists and beautiful human beings”. Robin Williams died at age 63, with 3 grown children from 2 previous marriages, with more than 100 movies and TV shows. 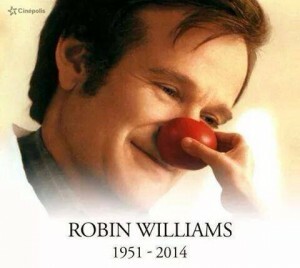 He will be remembered through the countless moments of joy and laughter he gave to millions.